I had a craving, which is what usually leads to me making far more complicated recipes than I would usually attempt. The craving was for this cool corkscrew shaped pasta, which I thought would go perfectly with a cheesy baked pasta recipe. 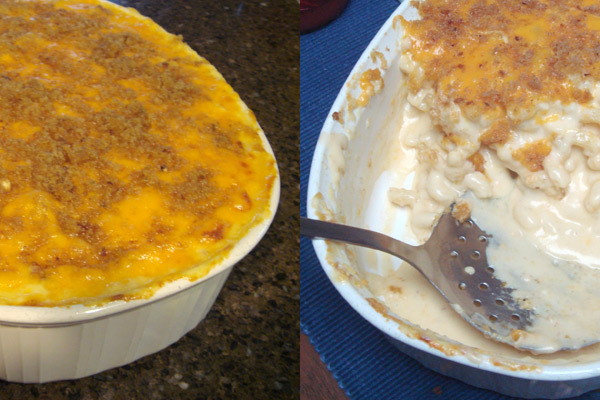 So I went on the hunt for a classic Macaroni and Cheese recipe and found a great one from Martha Stewart, which you can find on the marthastewart.com website here. I made some minor alterations, using orange instead of white cheddar, and a combination of asiago, mozzarella and parmeggiano instead of gruyere and pecorino romano. I also used ready-made breadcrumbs and melted butter instead of making my own. Anyway, while this dish was absolutely delicious and garnered rave reviews, I have to say it was far more time-consuming to make than I expected. And there was a lot of stirring involved. It’s a far cry from a box of KD, but I think it may become one of those dishes where it’ll be hard to go back to the orange powder. Ooh, I’ll have to try this! I’ve been craving mac n’ cheese lately…we had the good old fashioned Velveeta version a couple of weeks ago, but I’ve been really wanting homemade. Maybe once the heat breaks I’ll tackle it! I have had some of the Mac n’ cheese that you are talking about and I know that it was like having an alfredo sauce with lots more cheese than usual with the corkscrew shaped pasta. It was divine!